Laundry. Piles and piles of laundry. If your family is as active and busy as ours, you know what I’m talking about. Between my husband’s gym clothes, my yoga clothes, and my oldest daughter’s sports outfits, we go through a lot of laundry. Factor in my 5-year-old’s need to change into 12 different outfits a day and my son’s super-human ability to sweat at the first hint of activity, and we keep our laundry room really busy. I used to hate this particular chore because it just felt so mundane and never-ending. To make things even worse, sometimes I would pull a load out of the dryer to fold it and notice that it didn’t smell clean. It seemed like the odors I was trying so hard to get out of our clothes somehow ended up ingrained into the fabric permanently after being washed and dried. Something had to change. After a lot of trial and error, I finally figured out some tips for truly getting our laundry clean and fresh every time. Wash wet or smelly items as soon as possible. This might seem like a hassle, but it makes a big difference. The longer unpleasant odors and damp clothes are allowed to sit, the harder it is to get them really clean. I learned this the hard way. I remember actually having to throw away someone’s favorite t-shirt after multiple washes because it just never smelled clean. If you can’t wash something right away, be sure it is in a laundry hamper or bag that is breathable until it can be washed so it has a chance to air out and dry. This is a big one. We’ve tried so many different detergents over the years, from incredibly cheap bargain detergents to well-known brands, and there really is a difference. My absolute favorite liquid laundry detergent is Gain Fresh Water Sparkle™. It smells heavenly! One cap of Gain liquid laundry detergent keeps clothes smelling fresh from wash until wear for up to 6 weeks. It would take a 50 oz. bottle of the leading baking soda detergent to provide that much freshness. I love that the cap is clear so you can actually see how much detergent you are using and know you are getting the right amount for each load. All Gain Fresh Water Sparkle™ products are exclusive to Dollar General, and you’ll want to try all the great laundry products in this scent. For extra savings, check out these coupons. If you want to make doing laundry even simpler, try the new Gain flings!™ laundry pacs in Fresh Water Sparkle™. Gain flings!™ are packed with 50% more scent than Gain liquid laundry detergent. Just place the pac into the drum of the washer before adding your clothes, using more than one pac for larger loads. No pouring or measuring required, and the pacs contain everything you need for a load of extra clean, great-smelling clothes. Doing laundry has never been so easy! They dissolve in hot or cold water, so you can use them for any temperature setting. Even our stinkiest clothes and towels come out smelling amazingly fresh after using Gain flings!™. Plus, they make doing laundry so easy! Both Gain liquid laundry detergent and Gain flings!™ are compatible with regular and HE washing machines. As always, keep laundry products away from children. It’s so tempting to squeeze in just one more towel, or pair of jeans, or sweatshirt, or whatever. Don’t do it! Don’t exceed your washing machine’s maximum capacity for each load size because your clothes won’t come out as clean as they should. They need plenty of space to move around in lots of water if you want them to get as clean and fresh as possible. Plus, a huge load of laundry takes much longer to dry, often more than one cycle. If you’re like me and you often forget to turn it back on right away, your clothes could end up smelling like mildew. And who wants to start the whole load over again? For ultra-smelly loads, use an extra boost of freshness. Let’s face it–sometimes you end up with things that are just extra stinky. Your kid’s gym clothes that were left in a locker all weekend, or wet towels in your trunk from swimming three days ago, or a sweaty shirt shoved under a bed from who knows when. These situations require a little more odor-fighting power than regular loads. That’s why I’m so glad I found Gain Fireworks™ In-Wash Scent Booster Beads in Fresh Water Sparkle™ scent. Gain Fireworks™ are scent beads that give your clothes an extra boost of scent. Simply sprinkle the beads into the drum of your washer before adding your clothes. The more you add, the fresher your clothes will smell! My husband loves it when I use these. He can’t get enough of the Fresh Water Sparkle™ scent, and when I add Gain Fireworks™ he always comments on how amazing his clothes smell. Always use a dryer sheet. This not only makes clothes smell great, it also keeps static at bay, reduces wrinkles, and makes things feel extra soft. I always toss in a Gain Dryer Sheet in Fresh Water Sparkle™ scent to finish off the laundry routine the right way. Folding laundry never smelled so good! Head over and pick up all of these great Gain Fresh Water Sparkle™ products exclusive to Dollar General stores. For extra savings on Dollar General’s already low prices, click here. Add the new Gain flings!™ laundry pacs and Gain Fireworks™ In-Wash Scent Booster Beads in Fresh Water Sparkle™ scent to your laundry routine and your clothes will be fresher than ever. My local Dollar General store had all the Gain products I was looking for in a convenient place so I was able to quickly stock up on all the things I needed in Fresh Water Sparkle™ scent. Do you have more laundry tips for getting clothes smelling fresh and clean? Share your ideas with us in the comments! If you’ve been following the blog for a while, you know I absolutely adore my two cats, Edmund and Phil. Of course, that means we have lots of cat-related items in the house. Until recently, we always just kept cat food near the back door where it was accessible but not very organized, and other things like flea medicines just got stashed randomly on a shelf in the laundry room. We didn’t really have a great place to keep all of our cat supplies and food in one central location. As a bit of an organizational enthusiast, this lack of order really started to bother me, but I didn’t have any brilliant ideas about how to get it organized. But first, Morris has quite a story. He was discovered by an animal talent scout at the Humane Society in Hinsdale, Illinois, who immediately noticed his charming personality. At his audition, Morris was so charming that the art director declared him “the Clark Gable of cats”, and he soon became the spokescat for 9Lives, starring in over 50 commercials and even appearing in a film with Burt Reynolds. Despite his fame, Morris has always had a social conscience. He has spent much of his time visiting schools to promote kindness to animals, and he also launched Morris’ Million Cat Rescue to help find homes for animals in need. That’s worth celebrating, right? To see more about the story of Morris and his 50th Adopt-i-versary, check out this adorable video, or get to know his Cat Pack (yes, he’s that cool) in this article. Today I’ll show you how to make your very own DIY cat supply cabinet that will give you one place to keep all your cat food, flea medicines, brushes, and everything else feline-related. Plus, it will look nice enough to make Morris proud! First, remove any drawer pulls or knobs and put them in a safe place. Next, you can sand your cabinet (if needed) and wipe clean with a damp cloth to remove dust and grime. Then it’s time to get painting! Paint all surfaces that will be your main color, being careful to catch any drips before they dry. When the first coat is dry, add a second coat if necessary. When all coats are completely dry and no longer sticky, you can tape around the areas that you want to paint with a chalkboard surface. Now the paint needs to cure. This means you simply leave it alone for three days. Three WHOLE days. That may seem like a long time to wait, but if you rush it the surface won’t be as smooth for writing on. After it has cured, it’s time to prepare the surfaces with chalk. Lay a piece of white chalk on its side and rub over the entire chalkboard surface. After a few seconds, erase this layer of chalk and you can start writing on your chalkboard surfaces! Reinstall any hardware you removed from the cabinet. Now it’s time to start organizing all your cat food and supplies. A cereal container makes the perfect place for storing dry food, and it fits just right. I also picked up a handy 3-tier pantry organizer at Dollar General to keep our wet food organized so that we can easily see all the flavors we have at a glance. While I was there I also spotted these colorful trays that are perfect for holding flea meds, collars, etc. in the top portion of my cabinet. After getting everything situated, I’m so happy with the way our new cat supply cabinet turned out. Now all of our feline-related supplies are organized and in one place, and we won’t forget any important information regarding our cats! Every time I go to Dollar General for 9Lives cat food, I can stock up on all of Edmund and Phil’s favorite varieties and have an organized place to keep them all. Right now you can save even more on dry food at Dollar General with this coupon. And if your cats are like mine and enjoy a variety of flavors, get this one for extra savings on wet food varieties like 9Lives Meaty Pate with Chicken and Tuna, Hearty Cuts Beef and Chicken in Gravy, and Super Supper. Hopefully you’re feeling inspired to make your own DIY cat supply cabinet. Leave us a picture in the comments if you do–we love cat-centric projects! And be sure to visit 9Lives on Facebook to stay up to date on all the latest happenings with Morris. Using just these supplies, you can clean just about every surface in your house. Sounds easy, right? It really is! Here are some specific tips for tackling all of your chores with no harmful fumes or chemicals. Dusting– This is one of those chores that’s perfect for little hands so I usually let my kids do the dusting, but I don’t want them exposed to commercial dusting sprays. There are two all-natural dust-busters we use in our house, so I’ll share them both. The simplest method is to dampen a microfiber cloth, add 2-3 drops of lemon essential oil to the cloth, and simply wipe the surface with it. If you want extra shine, however, you can make this all-natural dusting spray that’s safe for all finished wood surfaces. Simply add 1 cup of water, 2 T. white vinegar, 1 T. olive oil, and 15-20 drops of lemon essential oil to a glass spray bottle and shake well. Lightly spray the surface and wipe clean with a soft cloth. Tubs,Tile and Grout– A paste made with baking soda and a little water can make scrubbing stains from grout and tile a cinch. Soap and water will also work on tile for everyday cleaning. Toilets and Ceramic Sinks– Sprinkle baking soda in sinks and toilet bowls and let it sit for up to an hour, then pour vinegar over the baking soda and scrub with a toilet brush or cloth. The baking soda deodorizes while the vinegar sanitizes, leaving your bathroom naturally clean! Floors (wood, vinyl, linoleum, and laminate)- A basic solution of 1/4 C. white vinegar and 1 C. water will clean most floors easily. For extra shine, you can also add 1 T. oil to the mix. Spray floors with the mixture and wipe with a soft cloth or mop. Alternatively, you can fill a bucket with 1 gallon of water and 4 cups of vinegar and mop the floor with this solution. Marble and granite– While vinegar is an amazing natural cleaner, it should never be used on natural stone like marble and granite, which can be etched by acidic ingredients like vinegar or citrus. Mix 1 C. water, 1/4 C. rubbing alcohol, 3-4 drops of dish soap, and 5-10 drops of any non-citrus essential oil (such as lavender, peppermint, cedarwood, etc.) Spray on surface and wipe clean. This solution can also be used for most floors, and it dries quickly without leaving streaks because of the alcohol. All-purpose cleaner– If you want to keep things really simple and just have one bottle of cleaner for most jobs, this is it. Mix 3 parts water with 1 part white vinegar in a glass spray bottle, add 15-20 drops of essential oils, and shake well. You can use this solution to clean countertops, sinks, tubs, showers, windows, floors, and even cutting boards and appliances. Just be sure to avoid using this one on granite or marble. If the idea of making your own cleaners is too overwhelming, or you don’t really want your house to smell like vinegar every time you clean something, there are plenty of non-toxic, natural cleaners available to purchase. I’ve tried several companies over the years, but my absolute favorites are from Red’s Gone Green. Her products smell so amazing that I genuinely want to clean my house just so I can enjoy the scent of clove-cinnamon-vanilla (which smells just like chai tea) or lavender-vanilla (incredibly calming.) Check out all of her products here. The all-purpose cleaners (except the grapefruit-orange-lavender) are even safe on granite and marble, so you can basically reduce your whole cleaning cabinet to just one incredibly fragrant bottle! Hopefully this is a helpful crash course on how to start swapping some of your commercial cleaners for more natural alternatives. It really is simple and affordable to enjoy the benefits of non-toxic cleaning supplies. Have other natural cleaning hacks or tips to share? Leave us a comment below! Businesses are targets for credit card fraud. This criminal behavior causes major problems for owners and patrons, especially if customer financial data is stolen. Because of this threat, Merchant Account Solutions offers point-of-sale systems that have advanced security features. If you are victimized, there are signs to look for that can help minimize your financial loss. Are your bills arriving late – or not all? If so, contact your vendors. Chances are identity thieves have rerouted your mail to a new address, so they can use your personal information to apply for and to max out credit cards in your name. Are creditors calling you about unpaid bills for good or services you never purchased? If so, there’s someone making purchases with your credit card information. Your customers will have the same issue if criminals breach your customer database. Advanced technologies like Clover POS system have built-in fraud and security protection that helps prevent ID theft. Look at your bank and credit card statements carefully. Pay attention to any unusual charges, especially small ones. Hackers often make small transactions first before making huge purchases. Call your financial institutions when you notice any suspicious account activity. You can get a free annual credit report from Equifax, Experian and Transunion. Monitor your credit regularly, so you can stay on top of what’s being reported to these firms. If you encounter the issues above, take action immediately. This may involve filing a police report and/or contacting the FBI’s Internet Crime Complaint Center. To protect your patrons’ financial data, use one of these advanced POS platforms. This post has always been one of my most popular on Pinterest, and it’s too perfect for the summer season not to share again. If you have a little one in PreK or Kindergarten, or if you’re a teacher of young children of any kind you’ll want to own this book! I will say, though, that even my 8 year old still enjoys reading the Howard Series 4 years after we added him into our home library, this lovable little bunny is just a lot of fun! I find that as a parent I try to make sure that most of the shows that my children watch and the books that they reads (or that I read to them) are not only entertaining and wholesome, but also have some type of lesson or learning aspect about them. Fun, silly, “just because” shows definitely have their place–but I want to make sure that we use every opportunity to teach them valuable life skills in a way they don’t even realize that they’re learning! Howard B. Wigglebottom Learns to Listen couldn’t have come at a better time as Amber has been having a few problems with learning to listen. You know, REALLY listen and obey right away. 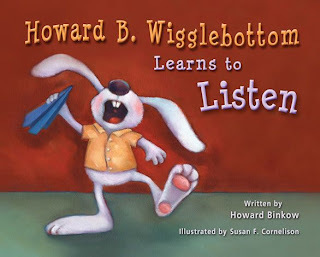 In Howard B. Wigglebottom Learns to Listen Howard is having a little problems with listening, to any and everyone including parents, friends, and teachers. Not because he’s purposefully being bad, there is just so much to be distracted by! This book is great because it shows the cause and effect of not listening, such as punishments from teachers, hurting friends or himself, and losing privileges, which are all shown in an engaging writing style. This book is great because it also shows the good things and rewards that good “really listening” bring! We both loved the fun pictures and the discussion questions at the end of the book too. Be sure to check out their website We Do Listen Foundation for free lesson plans, read alouds, and more! If you love this book be sure to check out our reviews of the other Howard B. Wigglebottom books as well! Applying for an ITIN number can be a daunting task, so it’s a common occurrence that questions exist throughout the process. The information below should be helpful in answering some of the common dilemmas that arise. What Type of Documentation is Necessary for the Application? U.S. Passport – this can be provided without additional ID. For applicants who are being claimed as dependents, school papers or a valid birth certificate are needed. Also, there are other documents that have to be included with the ITIN application. These include an original and legal U.S. federal income tax return, and, in some cases, the SSA letter of denial is also necessary. Generally, the IRS processes all ITIN applications in under 10 weeks. The more common time span is between 6 and 8 weeks. If everything was in order, then the applicant’s assigned ITIN should have arrived in the mail by this time. The W7 form is the official government form which must be completed in order to be assigned an ITIN. It is not possible to apply for an ITIN without having first submitted this form. Who is Required to Have an ITIN? Those who do not already have a Social Security Number, and are ineligible for the same, should obtain an ITIN number. Many different circumstances require an ITIN. For example, dependents and spouses of a U.S. citizen, resident alien, or a Visa holder need to have an ITIN number. This is also true of resident and nonresident aliens who are required to file a tax return with the U.S. federal government. There are many steps to securing an ITIN. The above details should help to clarify some common questions regarding the process and the paperwork. For more information, visit the ITIN W7 application website today. Earth Networks advanced weather alert system consists of lightning and weather observation stations in the US and around the globe in more than 45 countries. This network promotes understanding of weather events and their impact. By integrating crucial weather analytics into collaboration tools and meteorological services, businesses and communities can mitigate risk and ensure safety. Sensors installed in businesses, schools, and stadiums collect local data for neighborhood-specific reporting. The system consists of over 12,000 stations recording more than two dozen variables each day. More than 25 terabytes of daily data are analyzed using proprietary forecasting algorithms and is delivered in a comprehensive format accessible on any device. Neighborhood information is refreshed every few minutes for up-to-date, granular weather data from over 2.6 million worldwide locations. The suite of packages offered by Earth Networks can be custom configured, so each client gets the type of data they need when they need it. Lightning alerts are delivered 50% faster, with warnings for on the ground and in-cloud events as well as wind shear and downburst predictions. Broadcast alerts provide up to the minute weather metrics and live-stream local images, delivering a compelling and comprehensive local report. The automated outdoor alerting system for clubs and sports facilities is the first mass notification system available commercially. Lightning strikes are pinpointed with the integrated cloud-to-ground and in-cloud detection system. Alerts are automatically sent via text and email to ensure recipients are notified of threats immediately. Sferic Maps provide up-to-the-minute tracking of seasonal weather conditions. This enables parks and recreation facilities to clear the grounds, keeping staff and patrons safe. This advanced weather monitoring system provides critical data to a range of industries from airports and media to federal, state and local emergency systems. Visit EarthNetworks.com to learn more about their GIS data services, emergency alert software, LCD weather cameras and plume modeling. Alright, first off can we all just promise to be honest with one another for a few minutes here? While you are a totally awesome parent who does everything from creating an elaborate Summer Fun Pinterest Board to actually managing to DO some of those fun ideas, there is going to come a point and time this summer when you will NEED to put the kids in front of some screens so you can work or even just gain some sanity back! (And, well, I’m pretty sure you might be at that point). Trust me, it happens to us all! If you’re concerned it might happen a little too often this summer I’d recommend doing a Ticket System and having your young kids do chores for TV time – it’s worked great for us for several years now! These days we do a much simpler, scaled back version I’ll be posting about soon–so watch for that! Although I think screen time in moderation is completely OK for kids (especially when they earn it!) it helps when you know they’re watching great shows that aren’t annoying, dumb, objectionable, and that they might even learn from! Because I’ve made it something of a mission to track down these kinds of shows for my own kids I wanted to put together a list just for you of our favorites! It could probably be a lot longer, but I only wanted to share shows that we’ve personally watched and loved! Most of these are available on Netflix instant streaming, too, which makes them even better, and ALL of them are available through Amazon to purchase. Most are also found on PBS, Disney Jr., or Nick Jr. if you have cable/satellite/or access to a DVR. All of these shows are great for the ages of 3 to 7-year-olds. Since I haven’t ventured past that territory yet I don’t know much about great shows for older kids, but if you do please let me know by leaving a comment. I have a feeling it’s going to get even more challenging the older they get! Wild Kratts — this fun and educational show features the Kratt brothers and teaches kids all about different animals and their “creature powers”. One of our favorites I love how educational it is without being annoying and the kids love the fun features, suits, and “powers”. Zaboomafoo — Hand in Hand with Wild Kratts is what I think of as the partner kind of show which is also by the Kratt brothers and also teaches all about animals, which we love! In my mind this show is probably 3-5 year old range and Wild Kratts is more targeted for 5-8, but kids in any of that range could enjoy both. The Magic School Bus — I grew up on this fun and educational show and I have loved re-watching (and enjoying it just as much) with my kids! My little guy loves learning about our bodies and the episodes about the digestive and immune systems are some of his favorites! Super Why — this was one of Amber’s all time favorite shows when she was little and I think it’s a big part of the reason she knew all her letters and the sounds they made when she was tiny! Wordworld — Another Amber favorite and why she got a great start on reading young. This is also one of my favorites, I just adore the characters made up of the letters! Wishbone — I grew up on this TV show and it is one of my all time favorites. The kids recently got some of the DVDs as presents and now they love it as much as I always did! This is an especially great one for kids in the upper 6-8ish level, and even older kids will enjoy it. I think my huge love of classic literature started with me falling in love with the storylines in this TV series! Liberty Kids — Another one for the older age group, this is amazing for teaching kids about the American Revolution and all that time period in history. I love that George Washington and Benjamin Franklin are household names now. The Octonauts — if you love cute, adorable characters combined with learning ALL about the different kind of ocean life your family will love this show! It’s a top favorite of both the kids–and they still play with their Octonaut toys *all* the time! Little Einsteins — this is one of Tyler’s favorites! I love how they use the different kinds of (not annoying!!) music and also teach things! SuperBook — I already did a whole post about this series, but now that we’ve had and watched them for almost 2 years I absolutely LOVE them!! They do such a great job of sharing Bible stories in a fun and accurate way, as well as weaving in valuable lessons that apply to kids “real life” in the shows! Bo On The Go — this cute, funny little series is all focused on getting kids excited about moving (it’s perfect for those rainy days when you can’t play outside). Bo needs the kids to fuel up her energy and they do that by moving around. Blue Clues — a classic that came just after my childhood, as a teenager I turned my nose up at Blue and Steve but as a mom I decided I LOVED them! The story lines are engaging for kids and teach all kinds of things. Sesame Street — ok, ok. So as long as you’re not living under a rock you know about the classic learning program, but, just in case you ARE living under a rock, you should give it a whirl as well. It’s kind of hard to have an American childhood without at least a little bit of it. Team OmiZoomi — another super cute one, Team OmiZoomi is unique in that its focus is to teach basic math skills through fun story lines. Book of Virtues — these are great because they have a different focus for each DVD, but it’s broken into TV-length shows. They focus on everything from Fairy Tales to Greek Myths to Bible stories focused around a center theme like Courage, Honesty, or Faith, and all woven into kids daily problems and each with a lesson! Sid The Science Kid — I’ll be honest, this one *can* get a little annoying and the songs will get stuck in your head (hubby can’t STAND it) but the learning value is good enough it’s at least worth checking out to see if it pushes your annoying buttons or not! Jake & the Neverland Pirates — ok this one is a little light on the learning side, and might slide more into the next category, but the “gold doubloons” make for good counting learning–especially if you have a little pirate lover. While these shows do try to teach things like getting along with others, or life lessons, they are really (in my mind) more about fun. They’re all still very cute, age appropriate, exemplify good behaviors and kids love them! Rescue Bots — this is the kids newest LOVE. They have watched all the seasons through more times than I care to think about!! It is super cute, however, and I love that it’s a Transformer Spin off that is age appropriate. Busy Town Mysteries — an adorable show about solving mysteries with the classic Richard Scary characters. Kipper The Dog — if you don’t like English accents this show isn’t for you, but if like me you love them then it’s a must check out. Sweet and mellow it’s perfect for even the littlest ones! Daniel Tiger’s Neighborhood — SO sweet! If you grew up on Mr. Rodger’s Neighborhood you need to check out this spin off of it that has sweet family oriented lessons. Sophia The First — princess loving little girls will adore this fun show about a peasant turned Princess. Ninjago — another kid favorite, this one is probably the silliest one I let the kids fall in love with, but overall it’s just funny and one that your kids will love! Sherrif Callie’s Wild West — a little on the fluffy side but a lot of fun! So there you go! 24 amazing, fun, non-annoying TV Shows you can happily sit your kids down in front of! I know I’m missing some–comment with your favorite kid TV shows that meet all these criteria–we’re also always looking to expand our list! Why Say It With a Sock Is This Summers Hottest Trend? Companies that offer monthly subscriptions have become quite popular. You can find subscriptions for jewelry, makeup, clothing and fashion accessories. Say It With a Sock is a subscription service that sends its recipients one new pair of socks each month. Customers end up collecting socks that fit their style, whether that’s funky, professional or somewhere in between. You can tailor the products to your personal style by signing up for the boy’s, girl’s, women’s or men’s sock club. When you sign up for a men’s or women’s sock subscription, you want to know that you’re getting the latest and greatest styles. This company remains a hot trend by traveling around the country and the world to learn about the different fashions that are coming to footwear. With this knowledge, the company is able to offer socks in the latest materials, styles and brands. You have the choice to get these holiday inspired socks for yourself or gift them to someone you know. The company is able to be one of the hottest trends of the summer because it sends out high-quality products to subscribers. Even though you may not be familiar with every brand offered in the club, you can be confident that the socks you get will be durable, fashionable and comfortable. You can have this assurance because those sourcing the products know what goes into making a great pair of socks. Do you want to join one of the hottest trends of the summer and grow your funky sock collection? Check out the various subscriptions available through the women’s or men’s sock club from Say It With a Sock. Author NicolePosted on June 7, 2018 Categories Uncategorized2 Comments on Why Say It With a Sock Is This Summers Hottest Trend? Pampering the interiors of your house can be a brilliant way of giving yourself some rejuvenating feel. A well-crafted interior can immediately give an upswing to a dull environ, both physically and mentally. Whilst having the idea to revamp your interior, there are some definite pre-requisites to it. There are a whole lot of ideas available commercially, which can both attract you as well as baffle you at the same time. So take some time to understand your want and personality and get yourself a blueprint ready in order to avoid any mishap! Stylish wall panels have made itself quite an attractive catch in the market for those undergoing interior designing. This has definitely become possible for the wide variety of fashion in which wall panels have become available. They also cater to a lot of purposes in any numbers of ways. Whether it’s your living area or where your bed-time couch sits, modern wall panels have become quite successful. These wall panels provide a wide canvas for your creative ideas to get well expressed. You can paint them or put fascinating pictures or even wall hangings which can further elevate the ambiance. The chicest way to pull up any setting these days is to incorporate a well-finished brick wall. Once these stylish wall panels are introduced into the interior landscape, there is not much else to do but let them do their job. These beauties are amazingly stylish and modern looking which makes it ideal for bedrooms, kitchens and essentially for the living areas. If anyone of the walls existing in a room is given a brick wall finish, then very easily an elegant set up is created without putting much effort into it. To add to the crown, one can always opt for the ones with a glossy finish which can very well be the template everyone would want to replicate. Brick walls are not only style-friendly but also something which modern-day beings are mostly looking for- low maintenance. Cleaning them with a simple washcloth is all one would require keeping these creative pieces as good as new. The brick walls are also suitable for bathrooms, in which case one needs to be careful regarding molds. The bricks should be well sealed in order to prevent such situations. Modern wall panels in brick finish come in different colors to suit various settings; soft pastels for the kitchen, vibrant colors for the living area and so on. At times if the brick panels seem too much then it can be well balanced with some artistic artwork, mirror designs and so on. Wooden panels or cupboards can further accentuate the depth in brick walls illustrating more visual elegance. Planting good aesthetics with different types of interior decoration is one thing and to maintain them, in the long run, is absolutely a different swing altogether. These scientifically designed panels are of innovative styles with utmost longevity, durability as well as flexibility. They are essentially crafted with such attachments which make them appropriate for wall fittings. Being available in different styles, crafts designs and finish, they each resemble uniqueness and can very well decipher the same effect on the ambiance it surrounds. Starting from wooden texture wall panels to brick ones, glossy to matte; you wish for it and you will be served with it. Just pretty does not work and hence the panels are so structured that they can restrain fire, water, and any such damages. Besides, they are environmentally friendly as well as they are non-toxic and impact the environment in no harmful fashion. Charting a plan to install an interior modeling with panels is just as easy as actually doing them in reality. Being easy to install and not requiring the humungous time which otherwise interior designing takes, make these panels inspiring and applause-worthy. Built with gypsum, brick, acrylic, steel, MDF, leather and such other varieties, the vast array of choices produced for the consumers are absolutely lucrative. Since majorly these panels are crafted for educational, medical and industrial sectors, there are various ways in which they are put in the forefront. They can magically transform any ordinary space into a high definition scenario. Starting from hotel lobbies to the corridor, entrances to exits, these classy panels are all that one requires producing the perfect exquisite feel. Depending on the material your panels are made of, maintain them effectively. Different materials eventually demand different kinds of attention. Cleaning the surface now and then can keep the dust off, keeping the lustrous outlook at its place. Long durations of sunlight exposure to wall panels of kitchen, bedroom, and lobbies etc. can damage the finish. To prevent this from happening curtains may be utilized wherever possible. Keeping the panels dry and devoid of stains as fast as possible, if any is important. No water droplet should linger around for a while and should be removed to avoid conditions which help the development of fungus. The more care you take, which is not very tiresome, the more time you get to see these panels in an upTight condition. When the entire world has something new to offer always, interior decoration with panels have somewhat created quite a satisfactory position of its own. It can glorify any space in a mesmerizing manner which makes it a very popular one. With thousands of styles available, they can never go wrong or mishandled. Its easy installation and low maintenance have somewhat made it into quite a success. A little bit of care can go a long way and help these make an ideal setting. The very presence of these panels has the tendency to represent luxury which people these days are always hunting for.